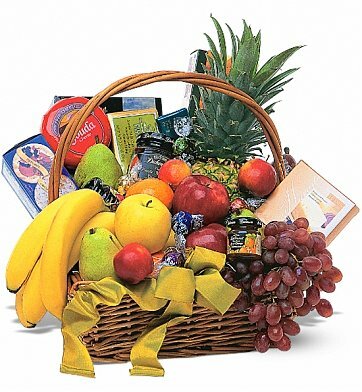 A welcome gift for any occasion, this classic basket offers recipients the healthy option of fruit with gourmet selections. Classic Fruit & Gourmet Basket is a hand delivered gift. These gifts are delivered by one of our local design centers located throughout the United States and Canada. Same day delivery is available for most gifts when ordered before the cutoff time. The cutoff time for Classic Fruit & Gourmet Basket is 1 PM in the recipient's time zone. Sent to a college student for his birthday. He loved the idea that it came with fruit and many more goodies. College students always can use food. Excellent service, very fast delivery, very good products, fair price. My daughter-in-law was appointed vicar of a church and this acknowledgement of her celebration was a surprising and welcome gift for her and her family. So much better than a flower arrangement. I highly recommend this choice. Recipient really loved it and would not open it until after 3 days so the presentation stayed the same. She said it was so beautiful! Thanks! We recently sent this basket as a sympathy gift. The recipient was very pleased with the presentation. The fruit was fresh and ironically, the treats enclosed by the local florist included items that the deceased loved. I am very happy with the quality and appearance of this gift basket. I ordered it for a coworkers family for the death of his father. They absolutely loved it, said it was beautiful and delicious. it was beautiful, large and very enjoyable. I colleague of mine lost his mother. I'm in Houston and the wake was in Ruston, LA. I went on-line to find your company, place the order after confirming it via phone. The woman on the phone was most helpful. This was on Sunday afternoon and the basket was there in Ruston, LA by 2:00 PM on Monday. The basket was beautiful and well liked. Thank you for all your help. we sent this basket to my Mother-in-law for her birthday....she loved it.... I not only had lots of stuff in it the stuff included a little of EVERYTHING. Delivered on time and well presented, they were very pleased with the basket. My mom raved to me about this fruit basket. She loved it for the holidays! I did not get to see the basket, since it was delivered to a different state, but the recipients said it was very nice, had a great variety of goodies, and they really were enjoying it. From their description, their basket probably overflowed just like the picture at GiftTree. I have to mention that the service from GiftTree was excellent. I definitely will use GiftTree again and recommend it to others. Customer really enjoyed this over abundance of fruit!!! The family we sent this to said it was absolutely wonderful. Great variety of different things. The fruit was excellent along with it's presentation. Everyone that ate something from the basket was very impressed. My aunt and uncle lived it! Said it was the best, ordered and delivered the same day! Awesome! I sent it to a friend who lost a love one. I bought this gift as a birthday present for my sister who's been having a rough time the last couple of months. The gift arrived on the day estimated & was in beautiful condition. My sister was thrilled with it!! Thank you for helping to make her birthday a good one. Perfect for a loss of a love one! Everyone was very impressed and beyond satisfied with the basket. Despite of their loss, they raved how delicious the fruit and snacks were! Thank you and will always buy from you!!! The recipient is 18 and he absolutely loved EVERYTHING in the Basket. everything in the basket was his favorite! Most definitely would recommend this gift basket. Wondeful variety and fruits were fresh and loved the combination of products along w/fresh fruits. Have never used Gift Tree but will most definitely use again! Thank you! excellent service---gift delivered on time as requested. the fruit was fresh and delicious; i do wish a pineapple was included though. also ordered and charged extra for was a box of chocolates that were never received. however, i would order again, but without extras. thank you. Had occasion, unfortunately, to send two baskets for sympathies to friends who lost loved one's. The feedback I got from two separate families on this basket was that they were very impressed. Definitely would recommend this basket for use on sympathy & happier occasions. Sent this as sympathy gift for someone who recently loss her husband. She lives across country on the west coast and I live on the east coast. I ordered it early that morning and it was delivered late that same morning, her time. I am very impressed. She really appreciated the sentiment. I ordered this in the morning for my daughter and she received it the same day in the afternoon. She loved it. She said there were delicious treats and lots of fruit. Everyone who saw it was envious. It was perfect! Great same day service and the person that received it could not say enough about it! Would recommend this basket and Giftree in a heartbeat! I needed a gift basket delivered to a friend's hotel room the same day. They didn't have access to a knife, so no fruit like a pineapple would work. Plus, my friend was doing city touring, so she needed a big mix of fruit, nuts, water, chocolate, cheese, just a little bit of everything. They completely hit the ball out of the park -- my friend and her husband were AMAZED! And the basket, which I ordered at 10am, was waiting at their hotel when they arrived at 5pm. This was sent to someone who is very fussy and her comment was that she was impressed.